The microbial capsules may be first captured in asteroids and comets, and then delivered to planets. Astroecology experiments with meteorites showed that microorganisms and plants can survive on these asteroid and cometary materials. The following passage is an analysis of the vectors involved in the capture of the capsules. In the target interstellar clouds, the density increases gradually from the diffuse cloud to a dark cloud fragment, dense cores, protostellar condensations and accretion disks. This allows designing the capsule geometry (size) for selective capture in the desired zone, based on drag by the medium as given by equation (3) for elastic collisions with gas molecules . Here d(m) is the density of the medium; v is the velocity, A(c) the area and m(c) the mass of the capsule. Note that A(c)/m(c) = 1/s(a), where s(a) is the areal density of the object. For a spherical object, s(a) = (4/3)d(c)r(c), where d(c) is the density of the capsule material, assumed to be 1E3 kg per m3 for a biological payload, and rc is radius of the capsule. Using these relations we can substitute for A(c)/m(c) in equation (3) to give the radius directly as a variable in equation (4), which was used for numerical integration. In these calculations we consider spherical capsules entering the cloud with a velocity of 1.5E5 per m, and consider that their velocity becomes homogenised with the medium when they are decelerated to 2E3 per m s, a typical internal velocity of grains in a cloud. Since most of the distance is covered during the high velocity entry period, continuing travel under further deceleration has little effect on the depth of penetration. Calculations also show that acceleration due to the gravity of the cloud adds only an insignificant velocity increment of about 1E4 m s-1 before entry to the cloud. 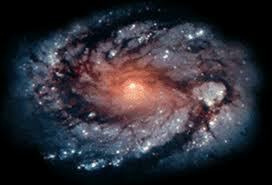 Other effects such as the complex gravitational and magnetic fields in the clouds require further study. Note that in equation (4) the critical variable is d(m)/r(c), ie., for a given desired penetration depth, the capsule radius has to vary proportionally with the density of the medium. To reach the dense protostellar regions or accretion disks, the microbial packets need to penetrate first through the less dense, but larger zones in the diffuse cloud, the dark cloud fragment and the dense core. Figure 2 shows the deceleration of spherical objects with radii of 35 m m and 1 mm, injected into these clouds with an initial velocity of 5E-4 c (1.5E5m per s), in terms of velocity vs. penetration distance as computed using equation (4), along with the radii of the various zones. 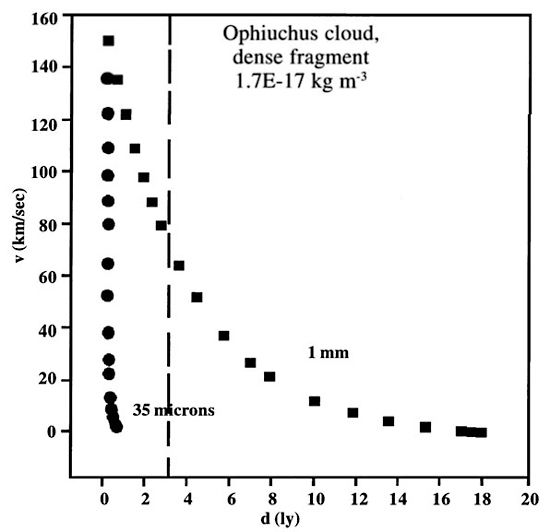 Note that both size objects penetrate fully the Ophiuchus cloud fragment (figure 2b). The 35 m m object is stopped in the dense core (figure 2), but the 1 mm object can penetrate it to the even denser protostellar condensations, where both objects are stopped well before full penetration. In this region, the 1 mm object penetrates only to about 0.5 of the radius. This is adequate so that the capsule will be incorporated into the dust cloud. In fact, larger objects with r > 35 mm would transit the protostellar region and would not be captured. These calculations illustrate the use of microbial capsule size for selective capture in desired regions. Capture in accretion disks requires special considerations. Statistically, most objects will encounter the 1E6m thick, 1E13m radius disks on the disk face (rather than the edge). An early accretion disk containing the original 100:1 gas/dust ratio can be considered as a homogenous gas medium with a density (from the mass/volume ratio) of 2.8E-5 kg per m3. The 1E-3 m capsule entering with v = 1.5E5m per s will be captured at a depth of 1E5m, about 1/10th of the thickness. At later stages of accretion, the disk becomes thinner, and dominated by increasingly large solid aggregates. Also, because of the close approach of 1E6m to the central plane of the disk before drag braking starts, the approaching objects may be significantly accelerated by the disk’s gravity. Once the disk is gas-free, the capsules will be captured into the disk by collisions with solids, or will be captured gravitationally into circumstellar orbits. In fact, capture at the later stages of cometary accretion, into the outer cometary crust is desirable as this facilitates the subsequent release and delivery to planets. Finally, for planetary targets, for objects placed in orbits near the planet at <3.5 au, a fraction of 1E-5 will be captured by the planet as noted above (note that this factor was not considered in reference ). For maximising the probability of success, it is desirable to maximise the number of survivable units for a given total payload mass, and therefore to minimise the capsule size. From the drag considerations, the optimal size for penetrating the cloud is 1 mm. However, once in the target region, sufficient drag is in fact necessary for capture, and the capsule size can be reduced further. In fact, it is estimated that only dust particles in the range of 0.6 - 60 mm can survive atmospheric entry and still remain cold enough to preserve organic matter . A median size in this range, of 30 mm and mass of 1.1E-10kg is considered below. This requires that the millimeter size capsules will be designed to disintegrate into smaller capsules once within the target protostellar or accretion regions. For example, the 1 mm capsule may be made as a looser aggregate that will disintegrate by collisions with dust particles, or by evaporation of the binding matrix in the relatively warmer target zone, into of 30 mm capsules. This particle size is comparable to the <1E-10 kg particles that constitute about 10% of the zodiacal cloud. Significantly, this particle size will not be ejected from the solar system by radiation pressure .